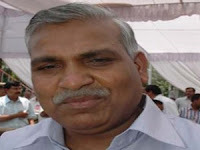 Central Bureau of Investigation (CBI) raided the residence of former family welfare minister of Uttar Pradesh Babu Singh Kushwaha in connection with the financial irregularities in the supply of medicines and medical equipment in the National Rural Health Mission (NRHM) scam on Wednesday. Kushwaha, a former BSP MLA had joined the BJP on Tuesday. The CBI also raided the premises of some officials and contractors in connection with the NRHM scam. The raids were being conducted at 60 places in Delhi, Uttar Pradesh and Haryana. It came as a shocker for the BJP as the party has inducted Babu Lal Singh Kushwaha within it's fold merely a couple of days ago. He has been given BJP ticket for the upcoming assembly elections in Uttar Pradesh. Raid on his residence is related to alleged irregularities in funds allotted to National Rural Health Mission (NRHM). Two senior medical officers were murdered in Lucknow within a year and investigations reveal these day light murders were related to the scam. After hue and cry from opposition Chief Minister Mayawati had removed Kushwaha from her cabinet and later on he was expelled from the BSP also. CBI raided 60 places in connection with the alleged scam.